Simple, clean and elegant are appropriate descriptions for this neoclassical archway. Perfectly suited to establish an entryway or to accent a favorite area in your garden, this piece incorporates large 5½" x 5½" posts and is available with or without the lattice extensions. 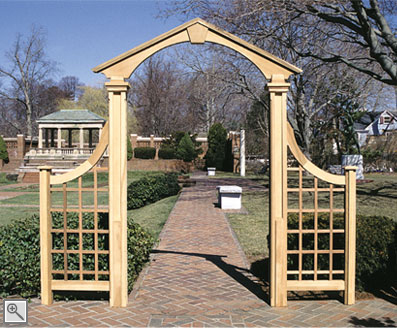 This arch is also a wonderful companion piece to our NeoClassical Arbor. Available with any of our gates and extensions as referenced in the Arbor Gates and Extensions section. Constructed of western red cedar and stainless steel fastenings. The opening for this arch may be customized to any size up to 5'.